Understanding the process could help reveal the moon's strange origins. The Stickney Crater on Mars' moon Phobos. New research suggests that reddish and bluish areas on the moon's surface point the way to understanding its formation. The eccentric orbit of the Martian moon Phobos could drive the flow of powder across the moon's surface, a new study finds, shedding light on Phobos' mysterious origins. Dark gray, potato-shaped Phobos is only about 14 miles (22.5 kilometers) wide, but it is by far the larger of Mars' two moons, at more than seven times the mass of its companion, Deimos. Phobos orbits at only about 3,700 miles (6,000 km) from the Martian ground, closer to its planet than any known moon; as a result of this tight orbit, Phobos zips around Mars three times per Earth day. The origins of these red units and blue units, as these regions are called, was uncertain. 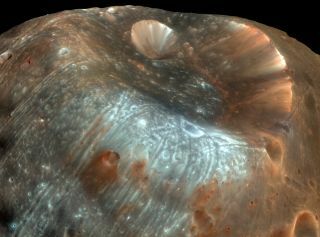 Solving this puzzle could shed light on the origins of Phobos and the way it interacts with its environment, the researchers said. To help solve this mystery Ballouz's group investigated the grains of dust and rock known as regolith, which drift around the surface of Phobos due to the moon's slightly oblong orbit. Although Phobos' orbit is nearly circular, it is very slightly eccentric, or oval-shaped. This eccentricity "is large enough to change the relative strength between Phobos' and Mars' gravity over each orbit. The closer you are to the Red Planet, the stronger its gravitational pull and vice versa," study co-author Nicola Baresi, an astrodynamicist at JAXA, told Space.com. As such, Phobos wiggles a bit as it orbits Mars, causing slopes on the moon to vary by up to 2 degrees over the course of the natural satellite's 7-hour and 39-minute orbit around the Red Planet. This slight tilting back and forth is enough to draw grains of regolith downhill on Phobos. Computer simulations revealed that the quantity of grains that flows "depends on where you are on Phobos," Ballouz said. When the scientists compared their data with photos of the surface of Phobos taken by the Mars Reconnaissance Orbiter, they found that the sites where they expected the highest amount of surface motion appeared to match the blue regions of Phobos. The motion on the surface of Phobos "is very gradual," Ballouz said. "There is not a landslide on Phobos every orbit. We call this a 'cold flow' process, as opposed to the fast motion of a landslide." "This process is not really expected to create new 'sand' or regolith," study co-author Sarah Crites, a planetary scientist at JAXA, told Space.com. Instead, the cold flow just moves existing particles around, she explained. The researchers suggested that the blue units consist of relatively fresh, unweathered material from Phobos excavated by the rocking the moon experiences during its orbit. In contrast, the scientists suggested that the red units consist of regolith that, for the most, part stayed put over time and got weathered by being exposed to solar radiation. These findings could shed light on the uncertain origin of Phobos. "One of the biggest mysteries surrounding Phobos is its origin — was it created from a giant impact onto Mars that created a debris disk around the planet that eventually coalesced into Phobos, or was it once an asteroid that was captured by Mars' gravity?" Ballouz said. If Phobos originated from a giant impact on Mars, the blue units should resemble Martian rock, since the blue units represent pristine material from the Red Planet. However, the latest data suggest that the near-infrared signature of the blue units differs from that seen up to now from Martian rock, the researchers said. The group is taking part in a future international mission led by JAXA called the Martian Moons Exploration (MMX) probe, which is set to launch in 2024 and return samples from Phobos to Earth in 2029. These samples may finally help resolve the debate over Phobos' origin, Ballouz said. The scientists detailed their findings online March 18 in the journal Nature Geoscience.